Kuchai Lama is a place that is known for its vibrant buzz with high concentration of the commercial shoplots. Some of the famous restaurants that can be found in Kuchai Lama are Meng Kee Char Siew, Tangkak beef noodles, Fish Head noodles and plenty of well hidden old establishments. Ask the foodies and they will recommend countless of places. Alongside OUG, Happy Garden, Lian Hoe Garden etc, these are considered as “Old Gold Mines”. 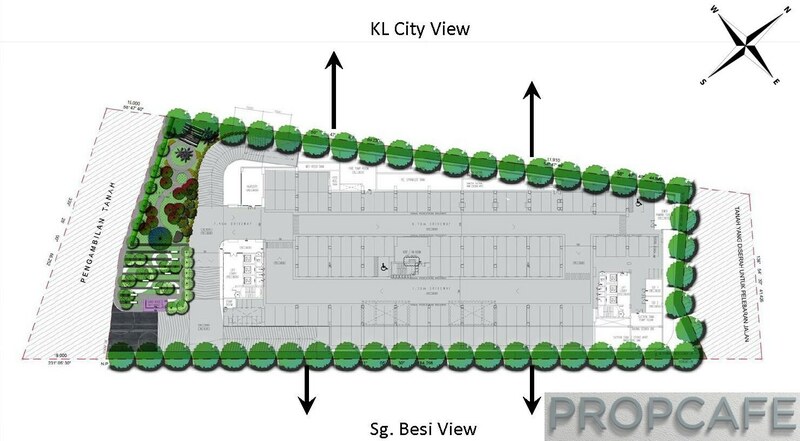 Big scale development in Kuchai Lama started with Dynasty Garden by Akisama and those buyers who bought a 3 bedders apartment in 2005 just for RM150-180K. The same unit currently asking for more than RM500K, tripled the initial developer price. Since then, many other developments have been launched such as Arte Kuchai Lama, G Residence, Dynasty series commercial centre and more recently luxury condos such as Le Yuen, Seringin, The Leafz, The Riyang and etc. All these developments mushroomed due to the demand of local population, strategic location, conveniences of amenities and accessibilities and proximity to KL city. The newcomer in Kuchai Lama is The Suite Starz @ KL South by CMMC Sdn Bhd. 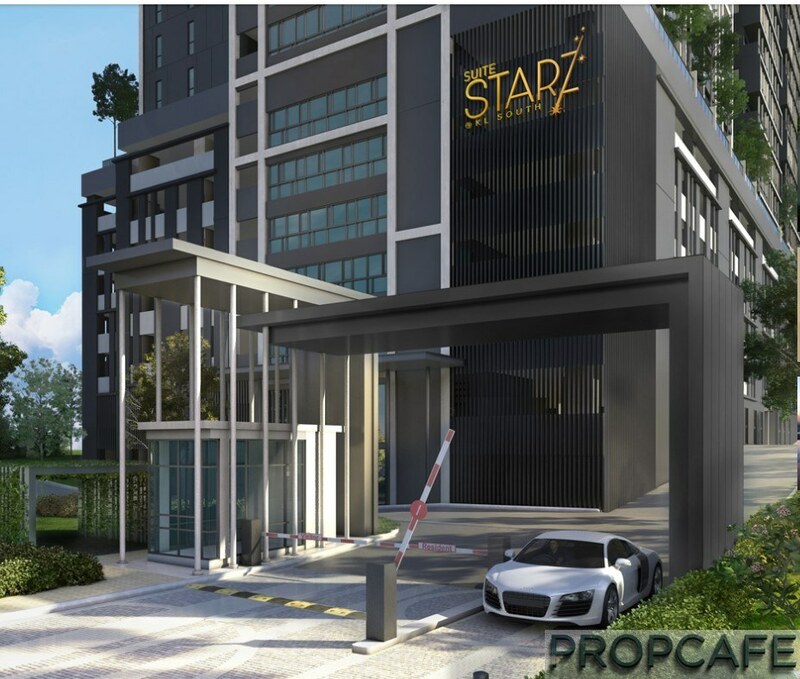 The Suite Starz @ KL South is neighbouring Salak South and south of Desa Petaling and Kuchai Lama. If we look closer we would term The Suite Starz @ KL South is located at the fringe of Kuchai Lama and sandwiched in between Salak South and Seri Petaling. The Suite Starz @ KL South has no lack of conveniences and amenities, however it seems all necessities are within short drive away. In short, it is not a pedestrian friendly and any residents will require form of transport for commuting. 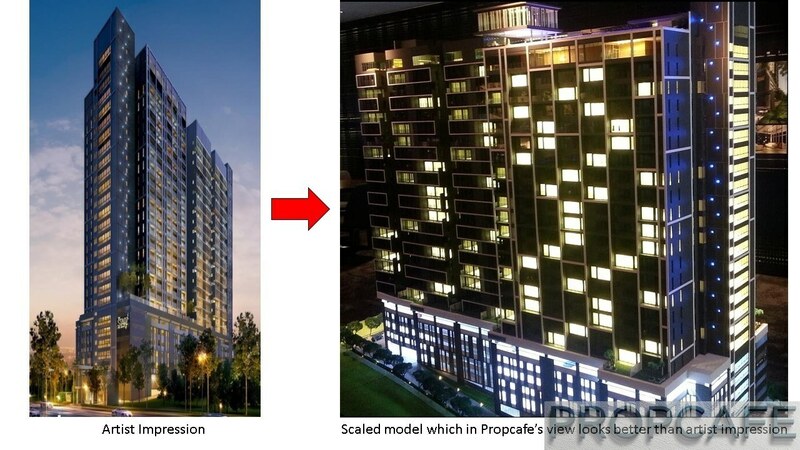 We in PROPCAFE would like to consider ourselves as intern in Property Market and we always explore and engage with salesperson and developer about their project not just about the project brief, investable development and location but anything under the sun and moon. Sometimes… when we have friendly salesperson or developer, we can have good few hours of chat and in the case with The Suite Starz @ KL South, they have been kind enough to entertain our unorthodox questions and exchange of some banter. Stunted (or more like amused) with our question with regards the aspiration of façade, the developer has been kind to share the architect’s development sketches before translated into the artist impression. With any project, the first task performed by architect is to perform a site visit. A site visit is very important for architect to observe site condition, contour, site restriction, accessibility, views etc. 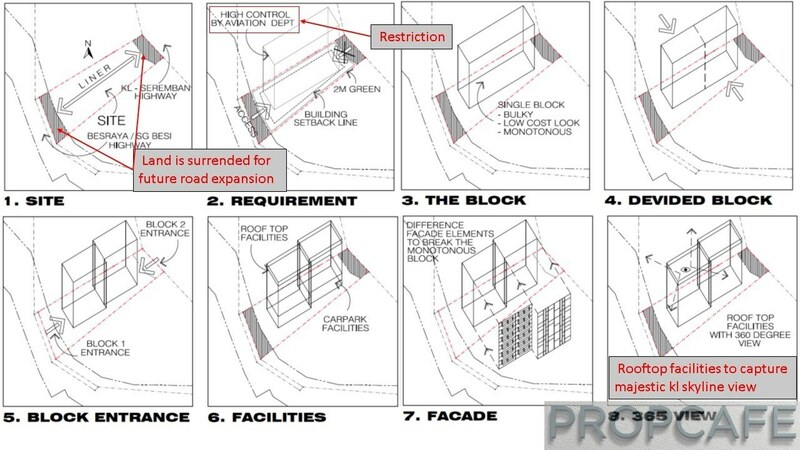 Prior the development started, the architect needs to aware of site and authority restriction and requirement. In The Suite Starz @ KL South, due to close proximity with RMAF, there is building height control by aviation department that limit the height to 25storeys. The developer is also required to surrender reserve land on both end for the future highway widening of KL-Seremban and Besraya highways. Building setback line is required for internal road and to keep minimum distance between the neighbouring buildings. This explains a smallish land < 1 acre is less valuable as after deducting the building setback line and land that is surrendered for future road expansion, there is not much developer can do on the leftover space. 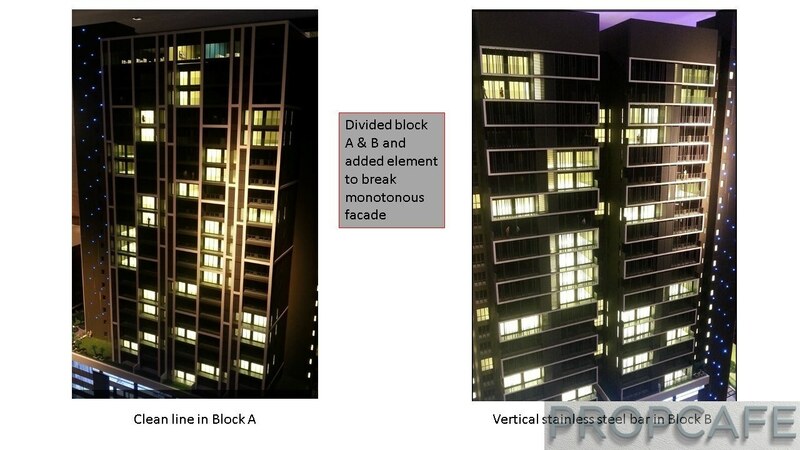 For more privacy of the residents, rather than staying with monotonous single block design with one lobby to serve entire residents, the developer has opted for two 25 storey blocks of A and B with dedicated lobby and drop off area. Both blocks are joined with common corridor. For added security, access door is installed in between to monitor the movement. To break the monotonous facade that associated with single block design even with current trend of glassy and modern façade, the architect has included varying element such as vertical stainless steel bar to break the monotonous façade. Taking advantage of the majestic KL skyline view, the architect has converted the whole 25th floor to rooftop facilities. Complete with array of facilities which will be covered later part of the review; the Arcadian deck is approximately 18,850sqft. In any development the highest floor is usually reserved as penthouse and typically it command the highest premium due to higher privacy, security and view. Assuming that the penthouse can command RM700psf, the developer has foregone approximately RM13.2million sales that potentially can go into their bottom line. Finally, with the magic touch of graphic designer, they transformed the architect’s vision into what we can see today as artist impression and developer construct a scaled model with show units to assist those with less imaginary mind. 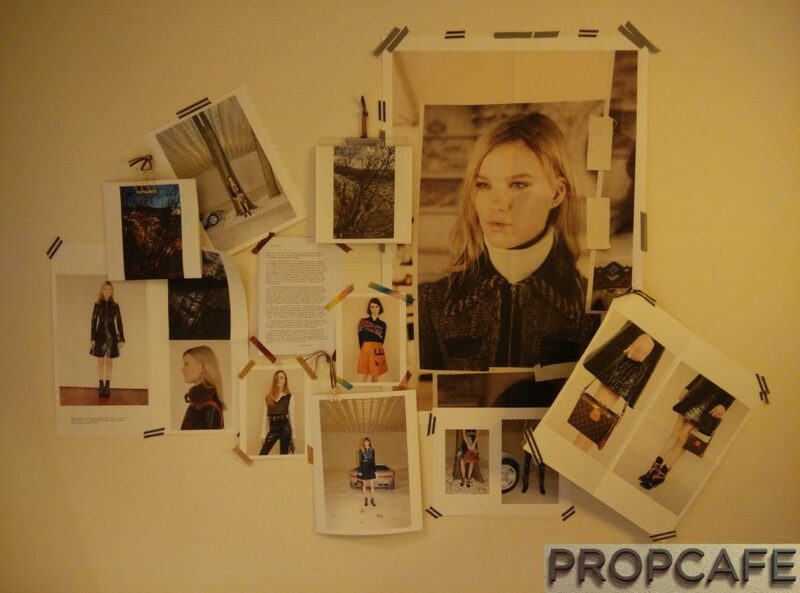 In PROPCAFE we live, breath and talk property. We are bunch of property aficionados. There is always something to be learnt every day. The lower ground to 5th floor is occupied with lobby, mail room and carpark lots where the units start from level 6 until level 24. The highest floor@25th floor is reserved myriad of facilities for the enjoyment of the residents. Tower A comprises of twin suites and duplex where all units with Sungai Besi facing are twin suites where else all the duplex units are with KL City skyline facing. The corners are twin suites. 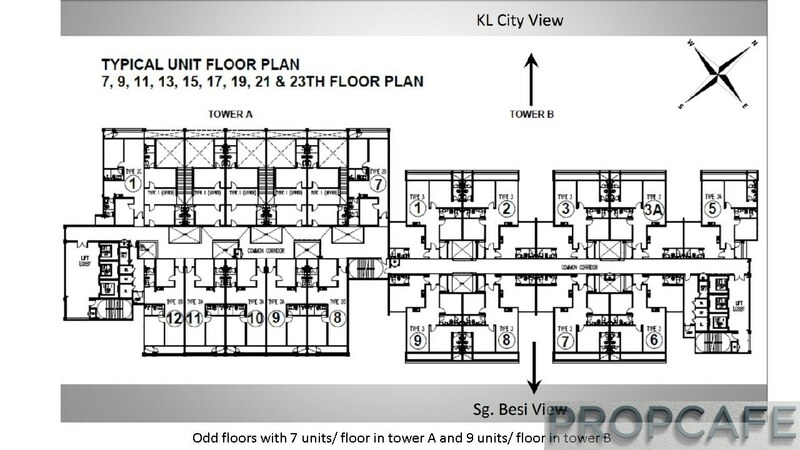 Tower B only comprises dual keys unit. The strangest layout is the twin suites where the yard is accessible via the bathroom for twin suites. A strange design. Among the layouts, dual keys caught the attention of PROPCAFE. What we like about dual keys layout? The master suite is true-blue dual keys unit with its own pantry, bathroom and separate electricity and water meter from the main unit. Ample storage space and nook and cranny space. For example a makeup table space next to master bathroom. SMD concept where each unit is only sharing one wall. This allows more window on dining and living as well as huge window on the master suite. All bedrooms are sized proportional and generously. What we do not like the dual keys layout? The living and dining space seem compromised to accommodate the concept of dual keys as well as generous bedroom size. However the kitchen open concept and widows at kitchen and living and expansive balcony will open up the space. The laminated flooring on the master suite’s pantry area. Require higher maintenance and any water dripping and splash should be wipe soonest. The units with KL City skyline should enjoy unobstructed view at time being. However units which facing Sungai Besi the view will blocked by neighbour development, The Central Residences by Yuk Tung Land. The STAR attraction (no pun intended) of this development is the rooftop facilities. 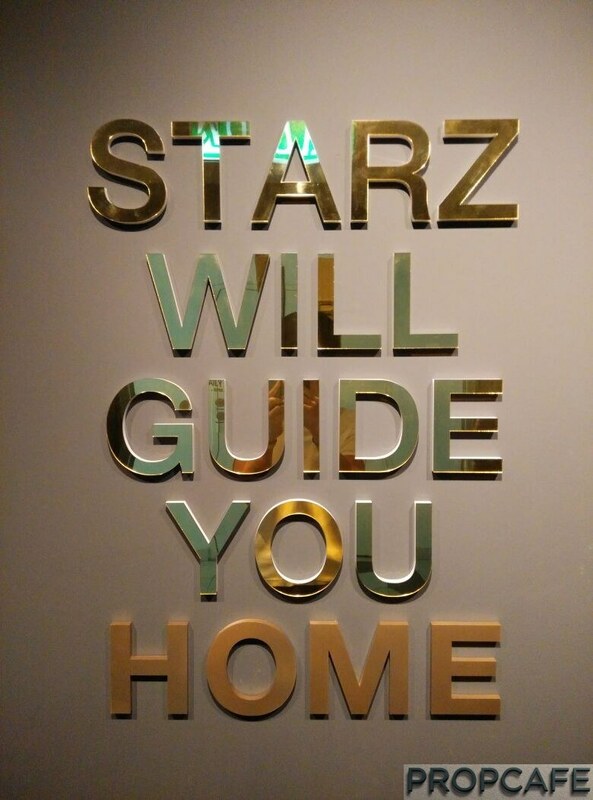 The tag is Get High at Starz especially if you are entertaining guests; you no longer need to do it in home. You can book Gastro Lounge and call in caterer or celebrity chef to whip up storm in the designer kitchen and impress your guests with amazing KL City skyline view. Imagine dining and throwing party basking under the KL skyline light and the view. After the dinner, you can bring your guests to the Hammock Garden and Neptune Infinity Pool where you can socialize while enjoying the KL skyline view or under the Star light, away from noises at ground floor. For families they are not forgotten. There is Nova Fitness Gym for healthy lifestyle. For some family moment, you can bring your kids to the kid pool or playroom or book the AV room for the whole family to watch a movie in cozy setup without disturbing your neighbors. There is a reading loft for residents who need “quiet time” with their books. Apparently there are myriad of rebates and freebies thrown in by developer such as Air-Con, Water heater, Renovation rebate and VIP Card to the prospect buyers. Please check with the developer for the latest offer. This is in line with the developer’s concept for The Suite Starz @ KL South where they determine to create a quality common space at rooftop with myriad of facilities for residents and their guests to enjoy and socialize. The Interior Design exudes vibrancy and modern lifestyle where contemporary setting is used. 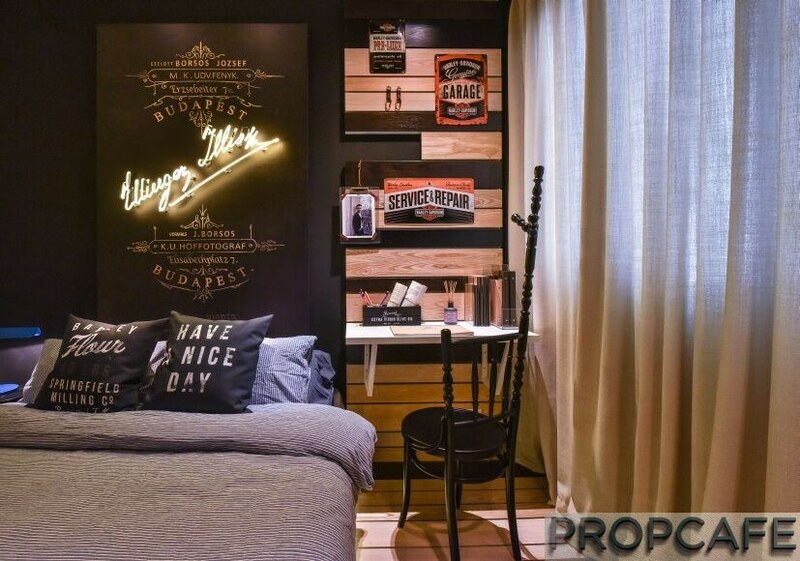 The wall art and furniture exudes youth and this probably bodes well with the target market which is young demographic that will appreciate the offerings by this development. However if buyers require a fully furnished package, there are 18 units of fully furnished duplex unit on the highest two floors. What else differentiate the development versus other? For start, developer has provided a car park storage for each unit. Yes! If you are condo dweller, you will know the hassle of moving your belongings from your car be it golf set, grocery bags, umbrellas, spare shoes etc from your car to your house. The carpark storage is 2’W X 1.5’D X 6’H which sufficiently big to put most of the above mentioned stuffs. To encourage healthy lifestyle, developer will provide bicycles for residents’ usage. 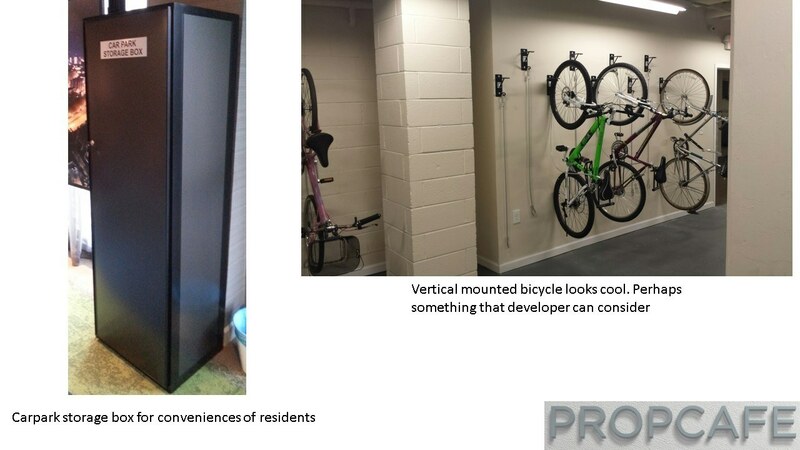 There is no indication of design but to compliment the whole development concept, maybe wall mounted rack to mount the bicycle can be provided. The developer can look into providing battery driven bicycle. Another special feature despite the commercial title land, the developer has decided not include retail at the ground floor despite the potential higher GDV. This will allow traffic control, better security for the residents. Sometimes if retails are empty or tenant mix is not desirable, it can bring detrimental effect to whole development. 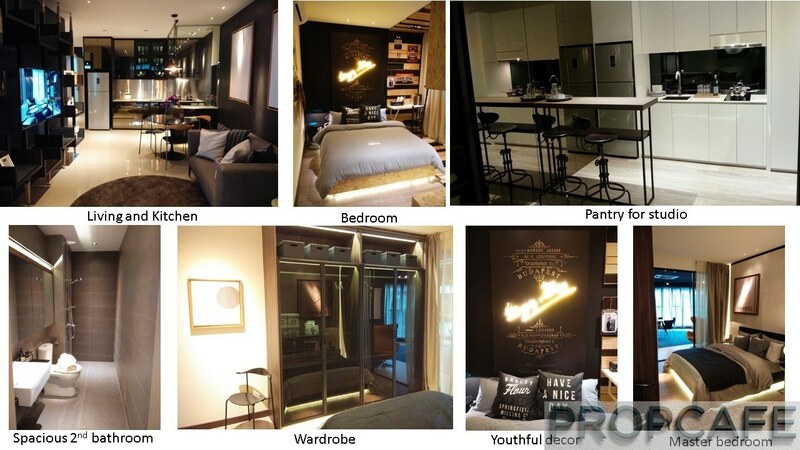 Aptly put by the developer, The Suite Starz @ KL South is a lifestyle development that provides an ineffable privacy of urban high-rise living with its sleek, flexible units compliment by luxurious rooftop facilities. 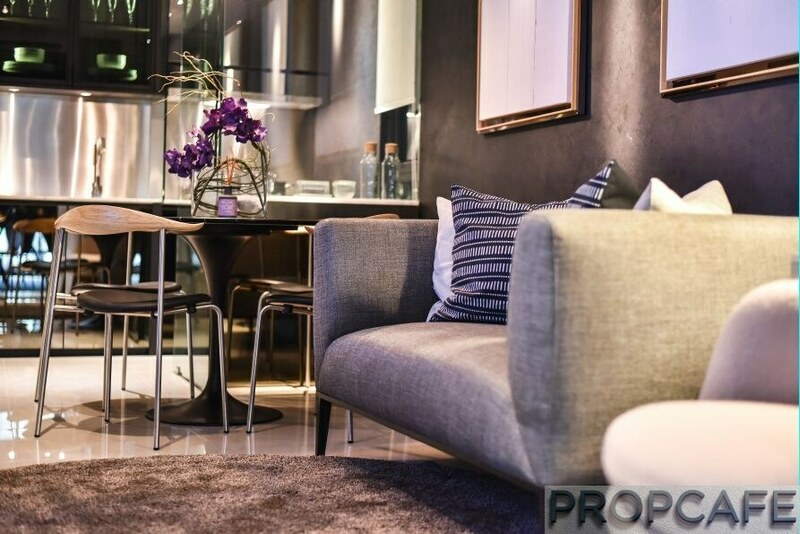 The Suite Starz @ KL South provides an idyllic home setting for people are looking for a dynamic and holistic lifestyle that closes to the KL city. Keeping within similar price range for that area, home buyers can enjoy a high-quality, distinctive residential living lifestyle with rooftop facilities. The Suite Starz @ KL South is flanked by 2 of the busiest highway in Klang Valley, Sg Besi Highway and KL Seremban Highway. If you are traveling town or coming back from town, needless to say, these 2 highways will be main arteries to The Suite Starz @ KL South. Alternatively you may also access to The Suite Starz @ KL South via Kuchai Lama through Old Klang Road. If you are coming from Shah Alam to The Suite Starz @ KL South you may opt to use KESAS Highway then passing through Sri Petaling or Kuchai Lama. 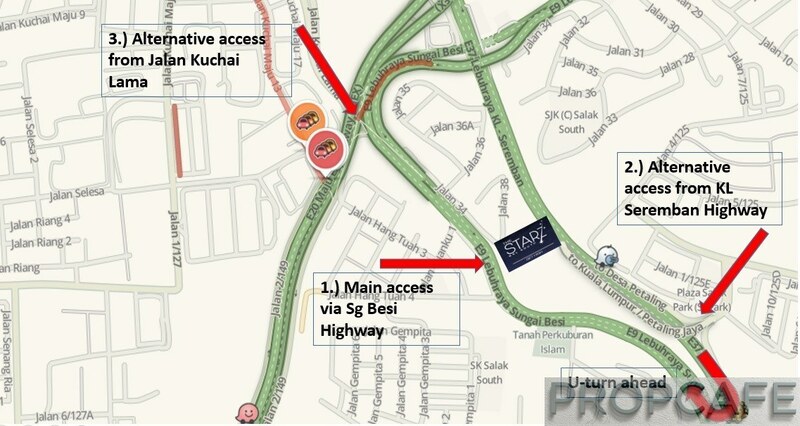 We see the drawbacks having Sg Besi and KL Seremban Highway as the main access to The Suite Starz @ KL South. Sg Besi and KL Seremban Highway highways are 2 main mainly accesses for south Klang Valley busy traffic is pretty much a given factor. Getting in from KL town no problem and to KL you need make U-turn along Sg Besi Highway. You can go try yourself with Waze as it is only 250m away from the development. 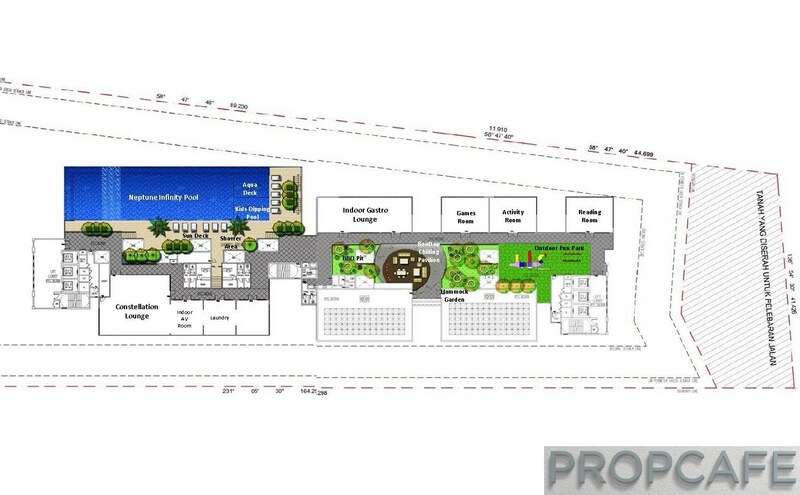 Despite the site is near to amenities but one has to drive. Somehow this gives us the feel of near to everywhere but it is also feels like out of nowhere. Aside main access via Sg Besi Highway, The Suite Starz @ KL South is linked to KL Seremban Highway, KESAS Highway, MEX Highway, Bukit Jalil Highway, Salak South Highway, plenty of options travel options, even easier when you have WAZE apps in your smartphone. If you are thinking of public transportation in terms of a bus stop right in front of The Suite Starz @ KL South doorstep or 50m away to the MRT station (which has its other own set of issues if it is THAT close), then you will be solely disappointed. However, from a convenience point of view, The Suite Starz @ KL South is in fact not very far from one of the busiest regional express bus/train hub of KL South, as Terminal Bersepadu Selatan at Bandar Tasik Selatan (TBS-BTS) is about 3.5 km away. This part of town in Southern Klang Valley has been in the buzz lately with the inclusion of couple of KVMRT Line 2 stations. 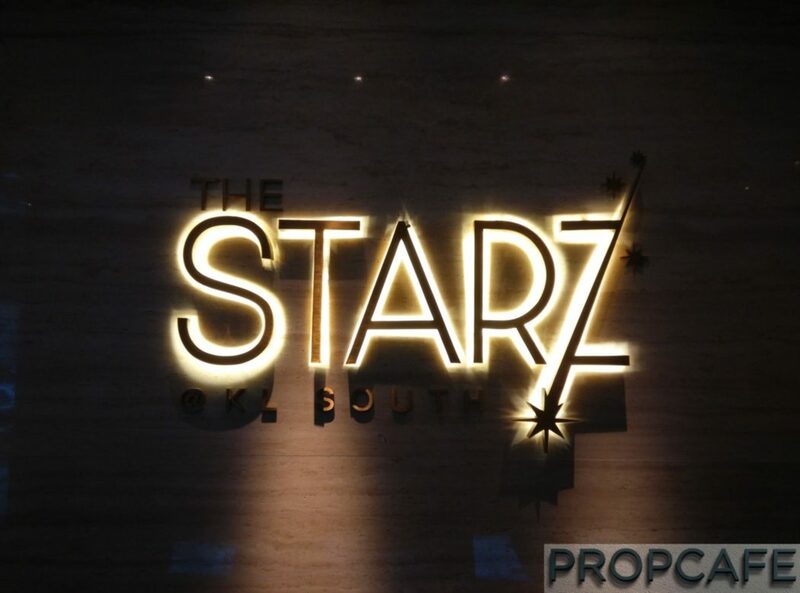 We expect The Suite Starz @ KL South to stand to gain. KLMRT Line 2 route map was finalized in October 2015, and presently the construction of the KVMRT Line 2 is ongoing and to completed in second quarter 2022. 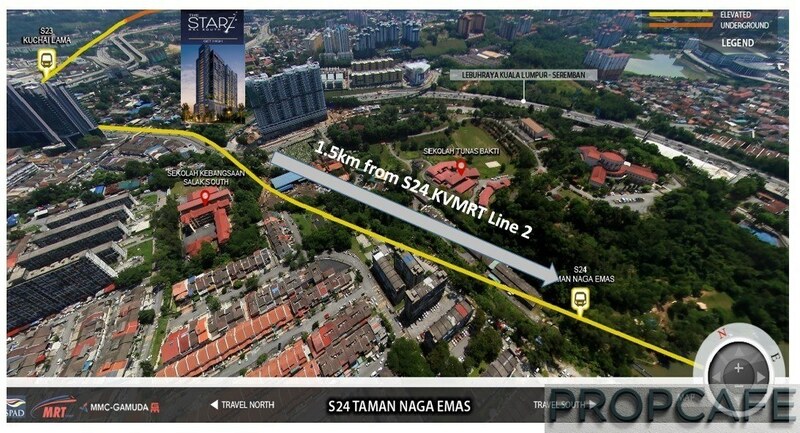 It is interesting to know that that MRT Line 2 Station 23 Kuchai Lama and Station 24 Taman Naga Emas are located within 3KM and 1.5KM from The Suite Starz @ KL South. Yes, it is arguable again that it is not a walkable distance and back to the argument the Suite Starz @ KL South is really neither here and there. Notwithstanding the 2 stations of KVMRT Line 2, another up and coming mega infrastructure that is coming to this part of the town would be the HSR. In case you do not know what HSR is, The Kuala Lumpur-Singapore High-Speed Rail is an alternative mode of public transport travel between Kuala Lumpur and Singapore. 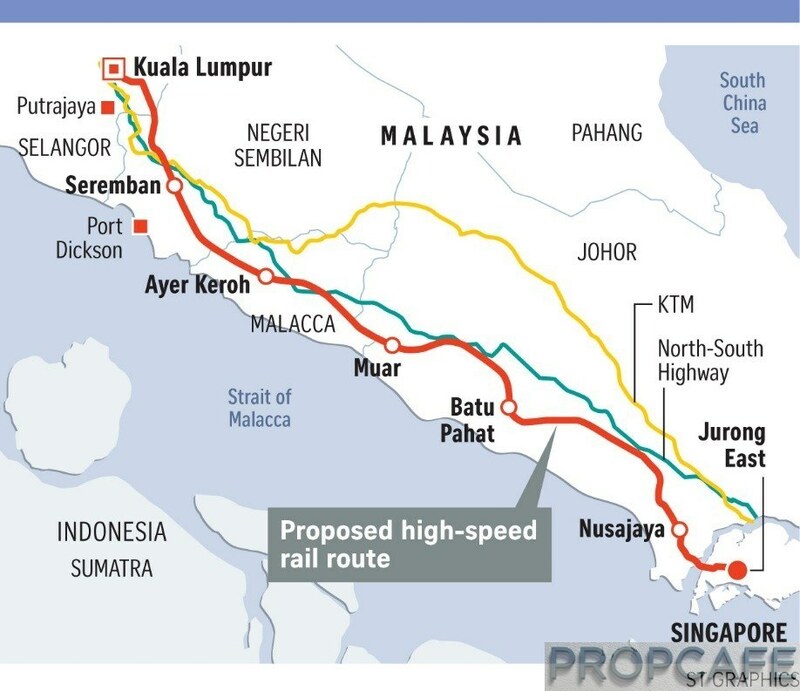 It will connect 5 cities in Malaysia to Singapore, connecting Seremban, Melaka, Muar, Batu Pahat & Nusajaya following a coastal route. It will also provide safe, efficient and optimal transportation and will be the solution for heavy congestion in this areas.The economic and social benefits derived from the agglomeration of 2 metropolises bring about a huge development potential. The geographical concentration of clusters of businesses and employees will result in an enlarged pool of specialist skills, labour and talent. HSR is integrated into KLMRT Line 2 Station 22 at Bandar Malaysia South, a mere 2 mrt stops away from Station 24 Taman Naga Emas. These 2 major infrastructures will be the game changer not just for The Suite Starz@ KL South but KL South as a whole hugely benefiting Salak South, Kuchai Lama, Sri Petaling, Taman Naga Emas folks. This is a lifestyle changing infrastructure will enable folks at The Suite Starz @ KL South to enjoy seamless connectivity to various destinations in Klang Valley, Southern region of Malaysia as well to Singapore. Imagine the convenience of just hopping on near MRT train station for school, workplace and vacations! Away from jam and unpredictable travel time, in exchange for more to spend quality time with love ones or other favourite activities, this indeed will change your lifestyle. So this is for investment or own stay? Before we go into this, let’s apply Sun Tzu’s The Art of War theory, know yourself and know your enemy ‘nearby developments’. If we look at the surrounding development, there are plenty of new supplies coming into this part of town. Majority of nearby developments in this vicinity are dishing out practical and good family size 3-bedder units ranging from 1200-1400sqft. In our opinion, this is the right type of products especially for upgraders and young families. But however coming in from investment point of view, the product has to stand, and The Suite Starz @ KL South provides certain differentiation among above developments, that offer good family sized units ranging from, dual-key units (3-bedders), duplexes (3-bedders) and twin suites (2-bedders). If we were to compare nearby newly launched properties, The Suite Starz @ KL South is priced within the expected range average at 600-620psf. With current buyer’s market, PROPCAFE think the pricing is quite ambitious where many newly launches are priced even lower than few year ago launches. However the downside of these catalysts is the timeline of completion for these infrastructures expected to happen beyond 2022 and that is provided there is no delay in completion! Maintenance fee inclusive the sinking fund is expected to be RM0.33psf. 3 lifts are serving each block with total of 6 blocks. There are in total 570 carpark lots for residents and 55 visitor lots. For the smallest size twin suites, 1 carpark is provided for intermediate unit and tandem parking for corner units. For the larger sizes dual keys and duplex units minimum of 2 carparks are provided. 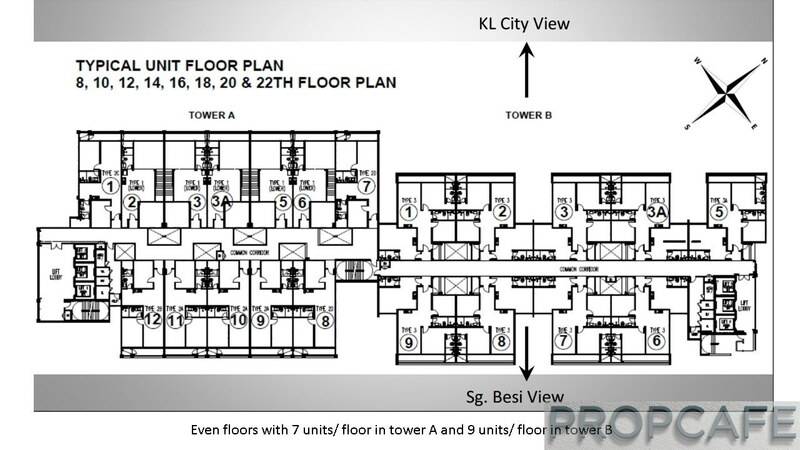 If you buy dual keys at high floor (>22th floor), 1 single and 1 tandem lots (total 3 carpark lots) will be provided. Typical security controls are via access card for car and residents at guardhouse, carpark and lobby access and access door between block. It is worth to note that across the Besraya highway there is a small Muslim cemetery. 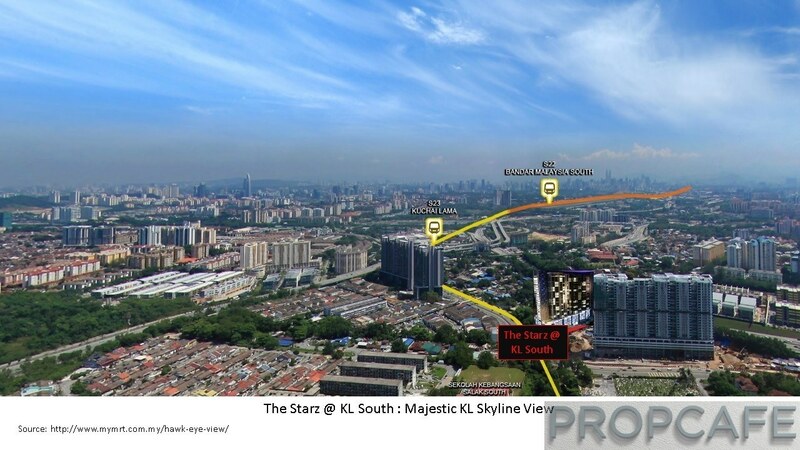 However it is not expected any of the units in The Star @ KL South will have a view on it due to its site orientation. The only unit which is unit. No. 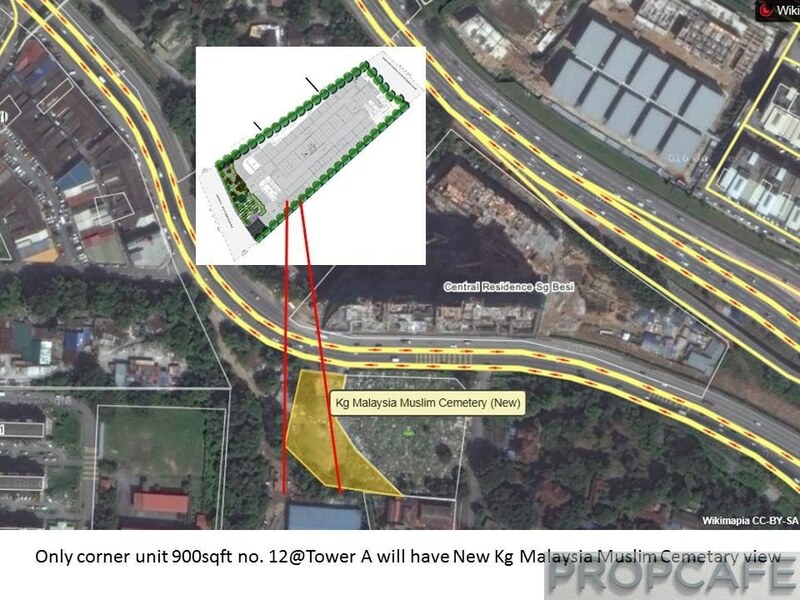 12@ Tower A will have small angle of view on the newly expanded Muslim cemetery. If you considering yourself a local in within this KL South zone, it would be a pretty ideal proposition. This is simply a new lifestyle that existing development cannot offer, with modern sky deck facilities, proximity to town, amenities within reach, mega infrastructures are heading this way, this part of the town which was sort of ‘neglected’ previously, now is slowly getting notice can only get better!